In medium bowl, mix cream cheese, sour cream and taco seasoning mix until smooth. Spread in 9-inch glass pie plate. In small bowl, stir jelly until softened. Stir in salsa. Spread mixture evenly over cream cheese mixture. Sprinkle with Cheddar cheese. 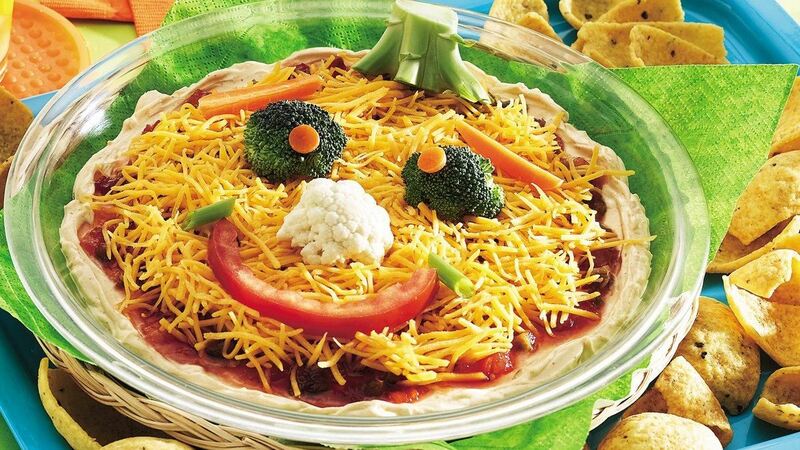 Decorate top of dip with vegetable pieces to look like silly face. Serve dip with tortilla chips. Store in refrigerator. Tip: For fun, serve black tortilla chips (actually dark blue) with this dip. Look for them in the chip aisle at the store.